[IMPORTANT] for security reasons, this app can not work on rooted devices, including factory-rooted. TCASH Now available to use for all Indonesia Providers Number (TCASH Agnostic). 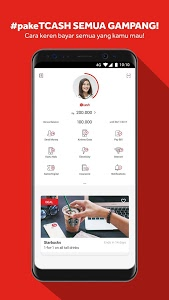 TCASH Wallet is a digital financial services application from Telkomsel in the form of electronic money (e-money). TCASH functions like a flexible and non-interest bank account. Services covered by TCASH include transfer to Pay Merchant (Physical Business) with TAP, Buy Pay billing on mobile phone, purchase airtime and data, Online shopping, and Money Sharing. 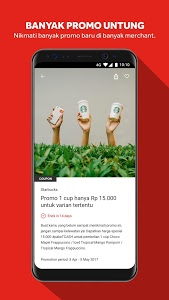 - Purchase Airtime & Data for all Indonesia operator Telko. - Request Sticeker TCASH TAP from Bill Menu. - Donation to Rumah Zakat, Dompet Dhuafa, etc. - Upgrade BASIC to FULL SERVICE Account in App. - Buy GOOGLE PLAY Voucher. 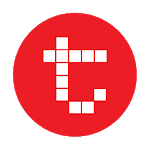 • TCASH TAP *: Enable TCASH TAP Sticker feature through android app to transact over 50.000 your favorite national and local merchants such as: McDonald, KFC, Chatime, Hokben and more. *) special android smartphone that does not have NFC features. 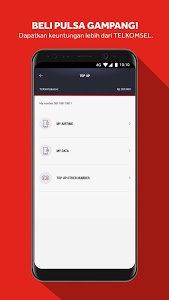 For Android devices already owned NFC Features, simply activate inside the apps on setting menu. • TCASH SNAP: Payment by scanning (SCAN) QR Code present on TCASH merchants. Now refilling your TCASH balance is easier, by showing the token authorization code that is in the TCASH Wallet app in the merchants that have collaborated. Fill out the pulse and packet data internet quota faster and safer, and also available a variety of attractive packages! Telkomsel pulses ranging from 10,000 IDR to 500,000 IDR include quota up to 2GB! or to purchase internet data quota packages ranging from 1,000 to 100,000 IDR for each package guaranteed cheapest in Indonesia. Easy and secure bill payment, from utility bill payment, HALO post-paid bill, water bill, electricity bill using token and more in TCASH Wallet app. Now online shopping is easier and safer through the TCASH Wallet app, shop online at Blanja.com, Dinomarket, and FlowerAdvisor can use the TCash Wallet app, and find great deals with only TCash Wallet apps. Enjoy the easy sending of money to fellow TCASH Wallet users or to other bank accounts. The TCASH Wallet app now displays the latest promo-promo menu from TCASH, available in the app's main menu. TCASH Wallet apps also can use for donation to multiple organization. - Bonus Balance Remaining Status.